The bi-annual Leadership Training Camp (LTC) by FMSA will be back this December. Over the years, the LTC has gone through various developments, resulting in a more vibrant, interactive, and exciting 2-day 1-night training for aspiring leaders of the society. This time, the camp bounces back with the cooperation between FMSA and MUIS. 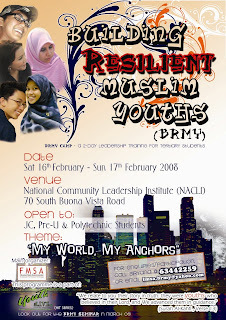 With the theme "My World, My Anchors", the camp will bring the youths to a discovery of the world that they will face as leaders of the future, and the necessary foundations or principles that they need to anchor down in themselves to be efficient and effective leaders - those desired by the society, blessed by God.